Did you know that many affordable upgrades are available for your Westinghouse UTT Series load tap changer (LTC) that can be installed during your next maintenance rotation? These upgrades are designed to extend maintenance intervals while improving reliability of the unit. This is the first in a three-part series intended to introduce you to upgrades currently available for the Westinghouse UTT series. This installment will focus on upgrading to the RMT-1 style reversing switch. 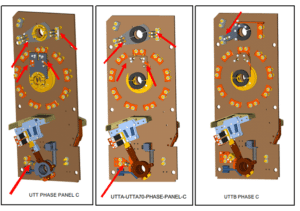 Below are 3-D models of phase panels for each of the different UTT Series LTC models. Red arrows indicate areas where overheating and coking typically occur. These arrows also help visually identify differences between the UTT models. Below is a different view of the moving selector switches for the UTT-A/A70 and UTT. Red arrows again point out common areas most affected by overheating and coking. Now that we have shown the different model types with their amperage ratings and how to identify them, we will describe the benefits of upgrading your standard reversing switch to the RMT-1 style. The purpose of the reversing switch is to select raise or lower connection of a tapped winding section. Each phase will contain a reversing switch on a 3-phase LTC. 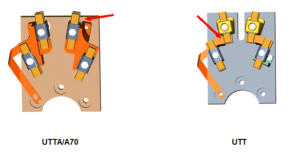 The figures below show a side-by-side comparison of the standard reversing switch designs and the RMT-1. Each upgrade kit from SPX Transformer Solutions’ Components Group comes with detailed instructions for installing the upgraded designs. Our 30-year history of providing replacement parts for the majority of OEM LTCs allowed us to develop the capability to confidently engineer, manufacture and support a myriad of design-enhanced replacement parts. You can be confident that the SPX Transformer Solutions version of the RMT-1 style reversing switch will match the performance of the OEM part at a fraction of the cost. Similar upgrades are available for the UTT, UTT-A and UTT-A70 selector and transfer switches. These other upgrades will be covered in detail in the second and third installments of this three part Tech Tip series. To learn more about all upgrades available for the UTT Series LTC, contact a member of our sales team at 1-800-338-5526. Also, don’t forget about our library of easy-to-navigate, 3D catalogs designed to help you quickly identify and locate hard-to-find components for LTCs and oil circuit breakers, while also including one for the SPX Transformer Solutions’ line of Transformer Health Products®.